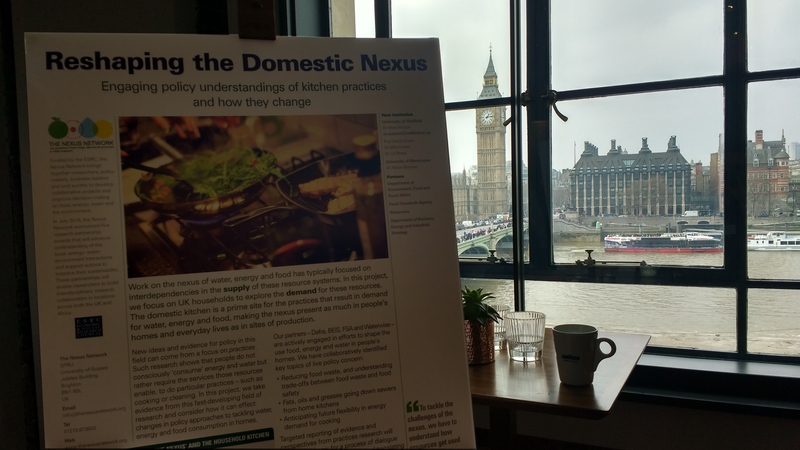 The project Reshaping the Domestic Nexus was featured prominently in the Sustainability in Turbulent Times report which accompanied the conference of the same name, the culmination of the ESRC Nexus Network programme. The report can be found here. How can practice theory be used to effect social change? That was an underlying question for the New Practices for New Publics workshop today, with a focus on how far practice theory can usefully inform processes of policy making and governing to effect positive social change. Appropriately, the project team was well represented there, with Matt Watson and David Evans providing two of the talks, along with Margit Keller (Turku). Others at the workshop wrote down questions at the end of each presentation, which provided the basis for a panel discussion, with Margit, David and Matt fielding some testing questions. In the interest and debate in the potential for practice theory to inform policy processes, the workshop demonstrated the salience of the ambitions of this project. The workshop was the fourth in an ESRC funded series of events designed to bring together cutting edge thinking in social science with the experiences of civil society organisations, especially those in the community and voluntary sector. Food of course presents us with a tangle of problems, that come down to the challenge of getting people sufficiently fed on a finite planet. Re-scaling food systems so production, manufacturing and consumption happens through more local relations is sure to be a field for useful change. But it’s a complex field, as demonstrated at the Localising Food Systems conference at Oxford University today, organised by the Local Nexus Network. We are delighted to welcome Dr Mike Foden to the project team today. Mike will be working full time on the project through to its completion next autumn. He joins us from the Centre for Regional Economic and Social Research at Sheffield Hallam and brings an excellent combination of topical expertise around sustainable consumption, energy and waste, with extensive experience of policy engagement.